Hispanic registered voters support Democrat Barack Obama for president over Republican John McCain by 66% to 23%, according to a nationwide survey of 2,015 Latinos conducted by the Pew Hispanic Center, a project of the Pew Research Center, from June 9 through July 13, 2008. The presumptive Democratic nominee’s strong showing in this survey represents a sharp reversal in his fortunes from the primaries, when Obama lost the Latino vote to Hillary Clinton by a nearly two-to-one ratio, giving rise to speculation in some quarters that Hispanics were disinclined to vote for a black candidate. But in this new survey, three times as many respondents said being black would help Obama (32%) with Latino voters than said it would hurt him (11%); the majority (53%) said his race would make no difference to Latino voters. 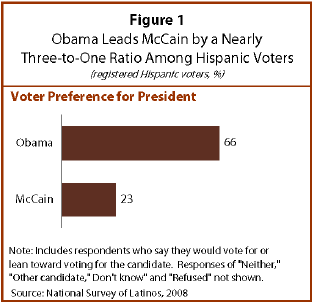 Obama is rated favorably by 76% of Latino registered voters, making him much more popular among that voting group than McCain (44% favorable) and President Bush (27% favorable). Hillary Clinton’s ratings among Latino registered voters are 73% favorable and 24% unfavorable; Obama’s are 76% favorable and 17% unfavorable. Also, more than three-quarters (77%) of Latinos who reported that they voted for Clinton in the primaries now say they are inclined to vote for Obama in the fall election, while just 8% say they are inclined to vote for McCain. That means that Obama is doing better among Hispanics who supported Clinton than he is among non-Hispanic white Clinton supporters, 70% of whom now say they have transferred their allegiance to Obama while 18% say they plan to vote for McCain, according to a recent survey by the Pew Research Center for the People and the Press. Latino registered voters rank education, the cost of living, jobs and health care as the most important issues in the fall campaign, with crime lagging a bit behind those four and the war in Iraq and immigration still farther behind. On each of these seven issues, Obama is strongly favored over McCain—by lopsided ratios ranging from about three-to-one on education, jobs, health care, the cost of living and immigration, to about two-to-one on Iraq and crime. In addition to their strong support for Obama, Latino voters have moved sharply into the Democratic camp in the past two years, reversing a pro-GOP tide that had been evident among Latinos earlier in the decade. Some 65% of Latino registered voters now say they identify with or lean toward the Democratic Party, compared with just 26% who identify with or lean toward the GOP. This 39 percentage point Democratic Party identification edge is larger than it has been at any time this decade; as recently as 2006, the partisan gap was just 21 percentage points. The movement to the Democrats appears driven in part by an overall dissatisfaction with the state of the country—70% of Latino registered voters say the country is going in the wrong direction—and also with a growing view among Latino voters that the Democratic Party is better attuned to the concerns of their community. More than half of Latino registered voters (55%) say this, while just 6% say the Republican Party is more concerned about Latinos. Also, some 78% of Latino registered voters say they are following the election very closely or somewhat closely this year, up from the 72% who said the same thing at this stage of the 2004 campaign. These poll findings, coming on the heels of a spirited Obama-Clinton nomination fight that led to rises in the Latino share of the vote in many Democratic primaries, suggest that the Hispanic community is politically energized heading into the fall election campaign. Hispanics are one of the most sought-after voting groups in the 2008 election— not so much because of their absolute numerical strength (they comprise about 15% of the total U.S. population but only 9% of the eligible electorate), but because of their strategic placement on the Electoral College map. At least four states where Hispanics are heavily concentrated—Florida, Colorado, New Mexico and Nevada—are expected to be battlegrounds in the presidential campaign. Beyond this particular election, one of the key long-term political goals of the Bush administration during the past eight years has been to make the Republican Party competitive among Hispanics—a group that is already the nation’s largest minority and that, by 2050, will comprise 29% of the nation’s population, according to projections by the Pew Hispanic Center. In 2004, Bush captured 40% of the Latino vote,1 a record for a GOP presidential candidate and roughly double the 21% that Republican presidential nominee Robert Dole had received in 1996. 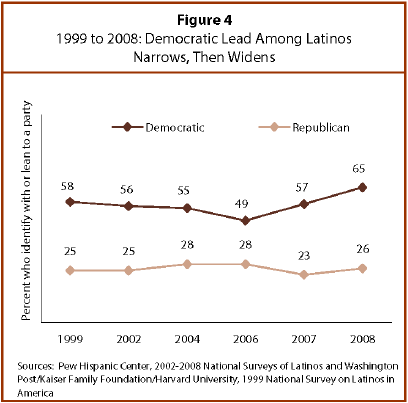 But in the 2006 congressional campaign, GOP candidates received only 30% of the Latino vote. In short, Latinos are a fastgrowing community that is strategically situated in presidential elections and that has a recent history of moving its support across party lines. This report is based on a bilingual telephone survey of a nationally representative sample of 2,015 Hispanics ages 18 and older, 892 of whom report being registered to vote. Interviews were conducted from June 9 through July 13, 2008. The margin of error for the full sample is plus or minus 2.8 percentage points at the 95% confidence level; for registered voters, the margin of error is plus or minus 4.4 percentage points. For a full description of the survey methodology, see Appendix 1. Among Hispanic registered voters, 66% would vote for, or lean toward voting for, Barack Obama; 23% would vote for, or lean toward, John McCain. More than three-quarters (76%) of Hispanic registered voters have a favorable opinion of Obama, and 73% have a favorable opinion of Hillary Rodham Clinton. 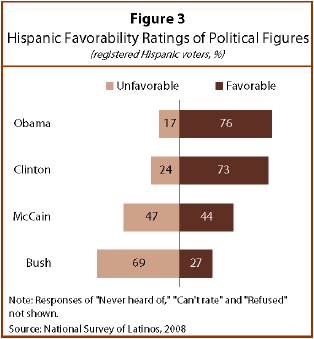 In contrast, 44% of Hispanics have a favorable opinion of McCain and 27% have a favorable opinion of George W. Bush. More than three-in-four Hispanics who voted for Clinton in a Democratic primary or caucus this year say they would vote for Obama or lean toward voting for him, while 8% of Clinton voters say they would vote for McCain or lean toward voting for him. Latino registered voters are almost three times as likely to say that being black will help Obama (32%) with Hispanic voters than hurt him (11%); the majority (53%) say his race will make no difference. 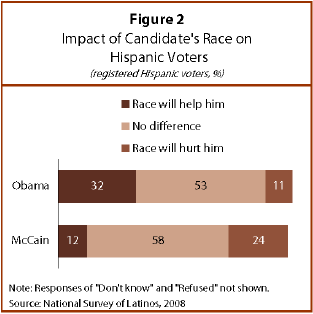 • More Latino registered voters say that being white will hurt McCain (24%) than say it will help him (12%); the majority (58%) say his race will make no difference. Family and pocketbook issues, such as education (93%), the cost of living (92%), jobs (91%) and health care (90%), are most important to Hispanic registered voters. Fewer Hispanics say that crime (82%), the war in Iraq (75%) or immigration (75%) is an extremely important or very important issue to them personally. By a ratio of more than three-to-one, Hispanic registered voters believe that Obama would do a better job than McCain in dealing with education (66% versus 18%), jobs (65% versus 19%), the cost of living (64% versus 19%), health care (64% versus 19%) and immigration (59% versus 19%). They also believe, by a ratio of about two-to-one, that Obama would do a better job than McCain on crime (50% versus 26%) and the war in Iraq (58% versus 27%). Among Latino registered voters, 55% believe Obama is better for Hispanics, 11% believe McCain is better and 29% say there is no difference between the candidates. Half of all Latino voters (50%) believe Obama is better for immigrants, 12% believe McCain is better and 32% say there is no difference between the candidates. More than two-thirds (70%) of Latino registered voters are dissatisfied with the country’s direction. In contrast, 27% of Latino voters are satisfied with how things are going in the country. Nearly four-in-ten (38%) Hispanic voters say that Latinos’ situation in the country has gotten worse in the past year, compared with just 18% who say it has improved. More than half of Latino voters (55%) say that the Democratic Party is better for Latinos while just 6% say the Republican Party is better for Latinos. Hispanic voters increasingly identify with the Democratic Party. Among Latino registered voters who identify with either political party or who say they lean toward a party, Democrats now hold a 39 percentage point advantage—larger than at any time in the past decade—with 65% of registered voters identifying as or leaning toward the Democrats, and 26% identifying as or leaning toward the Republicans. Latino voters are following the presidential campaign more closely than in 2004. This year, 78% of Hispanic registered voters say they are following the presidential race very closely or somewhat closely, compared with 72% who said that at a similar time in the 2004 race. About one-in-seven Latino voters (15%) say they contributed money to a candidate running for public office in the past year. Half of those who contributed money to a candidate say they did so using the Internet. Among Hispanic registered voters, more than half (56%) say that they voted in a presidential primary or caucus this year. Almost three-quarters (72%) say they voted in a Democratic contest, and 21% say they did so in a Republican contest. The 2008 National Survey of Latinos focuses on Hispanic registered voters’ views on the presidential candidates, the presidential campaign and Hispanic political participation. The survey was conducted from June 9 through July 13, 2008 among a randomly selected, nationally representative sample of 2,015 Hispanic adults, 892 of whom report that they are U.S. citizens and registered to vote. The survey was conducted in both English and Spanish. The margin of error for the full sample is plus or minus 2.8 percentage points; for registered voters, 4.4 percentage points. The terms “whites,” “blacks” and “Asians” are used to refer to the non-Hispanic components of their population.